Cut the nail phalanx of the brush: 1 - the edge of the nail; 2 - matrix; 3 - body nail; 4 - Lenochka; 5 - roller; 6 - the nail root; 7 - bone. There are two groups of diseases of the nails: 1) onychia - damage to the nail plate, the root of the nail and nail bed and 2) paronychia - damage to the nail ridges. Diseases of the nails can be congenital and acquired. Congenital onykii are characterized by a thickening or, on the contrary, thinning, atrophy of one or more nails. Often nails accept ugly form that are sometimes associated with other anomalies keratinization. The treatment is ineffective; it is recommended that surgical removal of the ugly nails, the appointment of vitamin A. Among the acquired defeats of nails distinguish three groups. 1. Diseases associated with violations functions of different organs and systems, particularly the nervous and endocrine. They are characterized by the simultaneous involvement of all or many nails in breach of trophic, the absence of inflammation, changes the color of the nail, the longitudinal splitting of the nail plate, education tuberosity or saucer-like concave, the appearance milky white spots, etc. Treatment: detection and therapy of the main disease. 2. 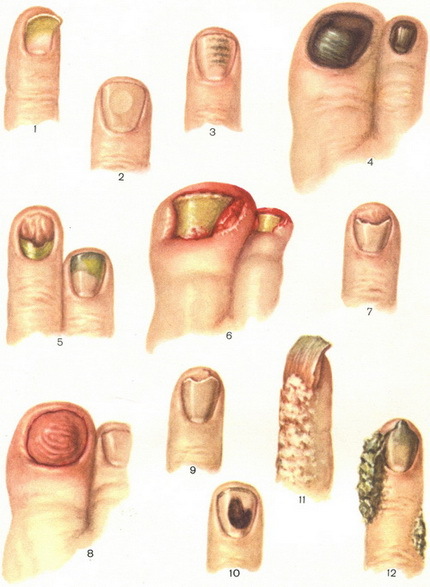 Diseases of the nails, related to the impact of external factors: trauma, burns, frostbite, the action of acids, alkalis and other, often professional factors causing usually partial detachment of the nail plate and discoloration of the nail, often in combination with paronychia; as well as biological factors, among which the most important are infectious agents - fungi (see Onychomycosis) and peacocke. The last cause inflammation of the nail ridges with subsequent detachment proximal part of nail plate. Treatment - hot baths with potassium permanganate, compresses, antibiotics. 3. Nail infections observed in various skin diseases: psoriasis, eczema and other Treatment (General and local), respectively basic disease of the skin. Fig. 1. Koilonychia. Fig. 2. Platonychia. Fig. 3. Dystrophia unguium mediana canaliformis. Fig. 4. Trophic changes of nails. Fig. 5. Nail changes when epidermolysis bullosa hereditaria. Fig. 6. Unguis incarnatus. Fig. 7. Onycholysis semilunaris. Fig. 8. Fibromatosis unguium. Fig. 9. Storchennest nail in the typist. Fig. 10. Subungual hematoma. Fig. 11. Nail changes when pityriasis rubra pilaris Devergie. Fig. 12. Nail changes when Polycrates of Touraine. Fig. 1. Onychognathus. Fig. 2. Nail changes when acrodermatitis continua Hallopeau. Fig. 3. Psoriasis unguium. Fig. 4. Psoriasis pustulosa. Fig. 5. Psoriasis exsudativa. Fig. 6. Psoriasis unguium (detachment of the nail). Fig. 7. Nail changes when scabies norvegica. Fig. 8. The candidiasis nails. Fig. 9. Epidermophytia unguium. Fig. 10. Trichophytia unguium. Fig. 11. Favus unguium. Cm. also the ingrown Nail.